Shipped from UK, please allow 10 to 21 business days for arrival. As New, First Edition, Hodder & Stoughton, London, 1998. As new copy in black cloth boards, gilt title on spine with an as new dust jacket. 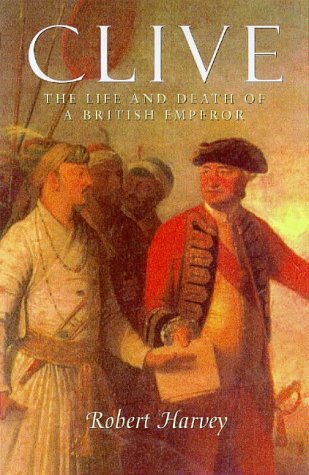 Clive: the life and death of a British emperor. ix, 406 p.,  p, of plates : ill., maps ; 25 cm.. . Includes bibliographical references (p. 389-390) and index. Not scanned per publisher request. .
Greenwoods Traders is committed to providing you quality and service. Our seller focus is used hard covers in the best condition and printing that we can provide. Inventory is selected with an eye towards a superior reading experience and lasting value. Purchases are thoroughly inspected. Traditional grading terms are used in our listings and every effort is made to identify and describe all previous owners defects. We also work to recognize and highlight unusual characteristics or exceptional condition. Our inventory is maintained in a dry, climate controlled, clean environment. Advanced system tools are in place to manage the accuracy of availability. Purchases are re-inspected during packing and you will be notified of any discrepancies for your approval before we ship. In preparation for shipping and future use, a new removable Brodart (Just-a Fold III) archival cover is fitted to the dust Jacket. Bubble pack is wrapped in layers around the book to primarily protect the corners and spine ends and taped securely. Packing materials are chosen to provide damage free arrival. A new 200 lb. box is our first choice. All media mail is shipped in a box. Domestic & International Priority for standard size (8 vol.) and below is shipped in a flat rate envelope. With books over 4Lbs., or not able to fit in U.S.P.S. flat rate boxes we will notify you if they require additional postal charges. Priorities are shipped within a day; all orders are normally at the post office no later than two days after receipt. We welcome questions and will response promptly. We can accommodate unique requests; drop shipping, gift note enclosures, special shipping or packaging, etc. We know from experience that problems can occur, if this happens, please don¿t hesitate, Email and allow us to try and solve it for you. We take great pride in the feedback from our customers. Thank you for your interest in Greenwoods Traders. Shipping will default to USPS Media Mail, Upgrades available upon request.